UPDATED: March 20, 2018 at 5:10 p.m.
Harvard College will no longer require applicants to submit scores from the optional writing portions of the ACT and SAT beginning with the Class of 2023, according to a Monday statement. Students who choose to take the writing portion of either exam pay an extra $14 for the SAT and $16.50 for the ACT, though fee waivers are available for both. Dane noted other ways applicants might demonstrate their writing skill, instead of on the standardized tests. The College accepts the Common, Coalition, and Universal College applications—all of which require a personal essay. Applicants also have the option to include an additional personal essay which, according to Dane, “most students will also choose to submit.” Applicants may also submit writing portfolios for faculty review. In 2014, the College Board, which administers the SAT, announced major revisions to its exam, which made the essay optional and scored it separately from the rest of the exam, among other changes. 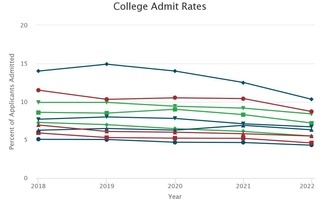 Shortly after the announcement of the SAT’s redesign in 2015, Harvard continued to require applicants to submit writing scores, but Dane said at the time that the College would evaluate how predictive those scores were of academic success. College counselors and higher education experts previously criticized the essay portions of the exams, arguing that writing scores do not strongly correlate with a student’s potential for success. The College Board and the ACT did not immediately respond to requests for further comment. Despite the choice given to students, the majority of the few million test-takers each year choose to complete the writing portion of the exams. According to the Princeton Review’s blog, Harvard’s decision leaves only 28 schools requiring the essays. In 2015, other Ivy League universities, including, Columbia, Cornell, and Penn, announced they were ending the essay requirement. 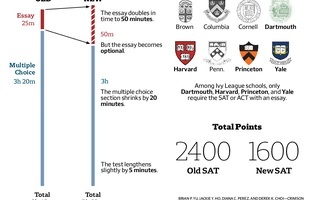 Brown, Dartmouth, and Yale are among the Ivies which still require essay scores. Among other peer institutions, Stanford requires the essay while MIT does not. When Penn changed its policy, Eric J. Furda, the school’s dean of admissions, cited what he called the essays’ “weaker predictive power” in a 2015 statement. “Our internal analysis as well as a review of the extensive research provided by the College Board showed that the essay component of the SAT was the least predictive element of the overall Writing section of the SAT,” Furda said. College consultant Anna Ivey said she was supportive of Harvard’s decision. “It's a good thing for colleges to drop the additional hassle and expense for applicants if the writing tests ultimately don't factor into the admissions decision much or at all,” Ivey wrote in an email. Some current students tended to agree, saying the essay portions of the exams may not be useful tools in the admissions process. Natalie G. Cohen ’20 said she thinks the policy change is a “good thing.” She said she believes the exam essays are not especially reflective of students’ writing abilities. Jordan “Jojo” A. Adler ’20, on the other hand, said she thinks the change is “not necessarily a good or bad thing.” Speaking from her own experience of taking the ACT, she said the essay was “not representative” of her writing. We are pleased that Harvard has decided to join the vast majority of colleges across the country and drop the SAT and ACT essay from application requirements.